"Now for a round-up," a political cartoon in support of the Sedition Act of 1918. Legislation passed during World War I to criminalize criticism of the government and other forms of dissent gave Attorney General A. Mitchell Palmer the powers he needed after the war had ended to order raids on the homes and offices of people suspected of having "communist loyalties" and "conspiring to organize labor." 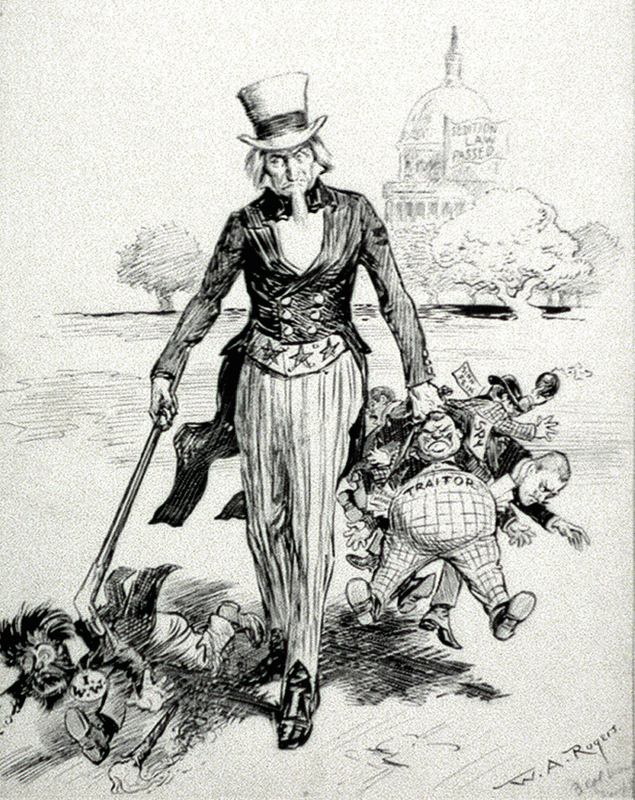 In this political cartoon from 1918, Uncle Sam hauls off a handful miscreants labeled "traitor," "spy," "Sinn Fein", and "German money," while he holds a leash on the International Workers of the World (I.W.W), presented as a mad dog.